Sakura Cha ('さくら茶', is classified into beverage), is known as Cherry Blossom Tea in English, and 樱花茶 (Yīnghuā chá) in Chinese. 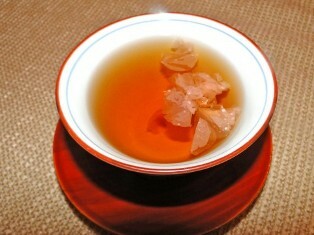 Sakura no Ocha, Sakura Tea. Cherry Blossoms, Salt, Hot Water. Tasty (A little astringent, Salty).